Any dog owner knows that your furry companion is more than just a pet—he or she is actually a member of your family. It’s one thing to care for your canine comrade at home where there is a dog bed, food and water bowls, and a specified place for playing. It’s an entirely different affair to safely travel with dogs in a motor vehicle, be it across town for an errand or across the country for a visit with friends and family. However long or short your trip may be, here are six essential safety tips for driving with dogs in the car. First and foremost, you should know what the laws are for traveling with animals in your vehicle. These laws can actually vary from place to place, so it is even more important to research the laws before you travel so you don’t accidentally get stuck with a steep fine. This includes laws regarding the safe transport of your pet, such as whether or not the dog needs to be in a carrier. Long road trips can have a number of challenges, but these multiply quickly if your dog does not like to travel or gets carsick. You can actually train your dog not to fear car rides. You start out slowly by getting your dog to eat food in a parked car that is not turned on. Eventually, work up to eating in the car while it is running. Then work to short trips that end some place fun, such as a dog park. This process can take weeks or months, so you will want to start well ahead of any long trips. With proper training, however, your dog could actually end up enjoying car rides! Getting carsick is a completely different matter that you can’t really train for, however. You may be able to consult with your veterinarian to see about medications to help calm your dog’s nausea or make him or her sleepy during the drive. You never know what might happen, so have some dog food and a water bottle on hand to keep your canine nourished. Stowing a spill-proof water bowl customized with the dog’s name will clearly mark what the bowl is for. Any time you stop for a long car trip, give your pet the chance to get a drink and some food, just as you would do. It’s difficult to safely operate a vehicle when your dog is bounding around the backseat and up into the front. For safety reasons, your dog should be safely in the back of your vehicle, but not in an open area such as a truck bed. There are pet barriers that you can install for most vehicles that keep your dog in the cargo area, or you may wish to cage-train your furry friend and have them ride in a comfy carrier. If you are concerned about the dog’s claws scratching up flooring or seat materials, consider a seat cover or cargo mat designed for pets. People were not designed to sit for eight or more hours in a vehicle, and your pet should not be expected to, either. If you are on a long trip, make it a priority to stop every two to three hours. Step out and stretch, and provide your pet the same courtesy. Go for a little walk and work out some pent-up energy before getting back in the car for a few hours. This is good for everyone’s health. There are many reasons why you should not leave your pet alone in the car. In the summer, the interior of vehicles can get extremely hot and suffocate animals. In the winter, temperatures can drop and your pet could freeze. In some places it is illegal to keep your pet unattended in a vehicle. 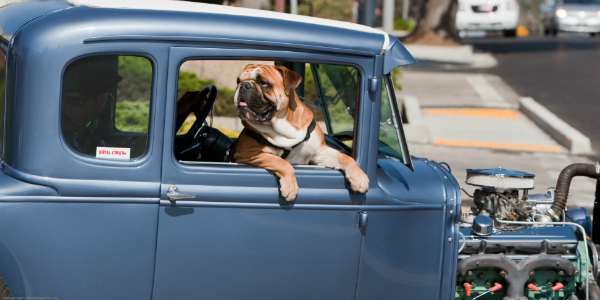 Avoid getting your windows smashed in by a Good Samaritan; don’t lock your dog in your car unattended! In many ways, traveling with a dog is a lot like traveling with a small child. You need to keep their needs in mind and be proactive in caring for them because they cannot otherwise care for themselves during a trip. These tips should help you and your canine pal to have a much more enjoyable experience in the car. Bryan Passanisi is an online marketer living in the Redwood City, California area. He graduated from The University of San Francisco with his Bachelor’s Degree in Marketing. He is an animal rights advocate and loves corgi puppies. Bryan Passanisi is a contributor to various websites and blogs including Shutterfly. CC Image courtesy of Mike Baird; Bulldog in fenderless 1931 Ford classic hotrod street rod car on the streets of Morro Bay, CA on Flickr.